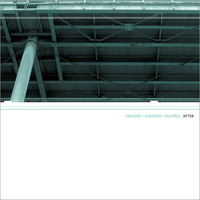 After is the product of the meeting of Kim Cascone, Richard Chartier, and Taylor Deupree at Montreal's Micro_Mutek 2 on April 6th, 2001. Scheduled to perform solo sets they decided to do an unexpected improvisational live laptop set at the end of the evening which ended up being one of the highlights of the evening. Each artist utilized his own software and contributed his own sound to the 20+ minute performance. Cascone's custom Max/MSP patch sputtered and spewed random chunks of soundfiles while he processed the output in real time through various effects. Chartier ended up being the unlikely designated rhythm unit for the night; supplying pulses, basses and precision-craftted clicks. Deupree washed over the whole mix with gentle drones and blankets of sine wave layers. The result was a surprisingly diverse, layered, and engaging recording. 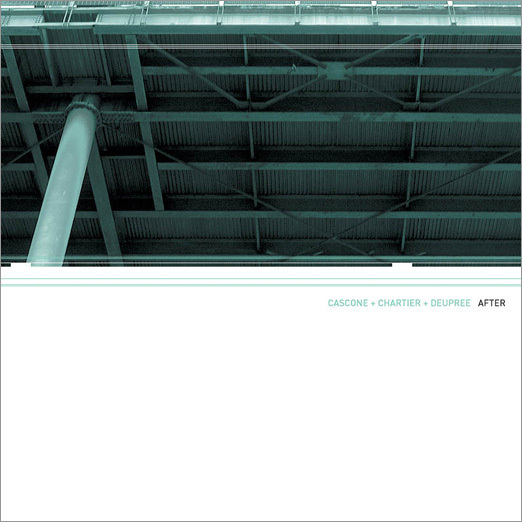 With a desire to release and catalog the evening's production, Cascone, Chartier, and Deupree decided that to extend the time of the project to make a full length cd that each of them would create a new work using the original live set as source material for their piece. Cascone ushered in a new era of dense DSP with the "New World Rising (New Density Mix)," a reworking of key elements from the end of the performance treated with his ever-evolving Max creations. Chartier chose the more subtle elements of the night and created "Afterimage." Deep, filtered tones create warm washes of bass that are punctuated by fragments of the original soundfiles that he used during the live set, more audible than his more recent compositions. Deupree's "4+2_Stil Live" reconstruction uses a mix of 4 loops layered by an additional 2 passages which he then works into new loops using custom programmed software algorithms. These new loops are then structured to form a highly repetitive and evolving piece of churning, hypnotic tones . . . a preview and exercise into methods for his upcoming cd Stil.